Today I have had the pleasure of being in Jacksonville, Fl, for the Diocese of the South’s annual clergy retreat. Our speaker is Fr. Michael Oleska who teaches in Alaska, and is probably the foremost authority of the history of Orthodox missions to America, as well as Orthodox missions in general. Our lecture this afternoon was excellent, particularly connecting the fairly well-known work of early missions in Alaska, with the larger history of Orthodox missions in general. One of Fr. Michael’s distinctions was interesting, if only for the generalization it drew of a difference between the East and the West in Christianity (one should never push that distinction beyond its limit) – but I thought his remarks were well on target. He noted that there is a general line of demarcation in Europe between East and West, between that part of the world whose legacy is owed to Byzantium and that part of the world whose legacy is owed to Rome. He noted that the Eastern world had been forged in the military conquests of Alexander the Great, who, to the largest degree, conquered civilizations that were older and more advanced than his own Macedonian/Greek world. Areas such as Persia, India, Egypt, were all very old, revered civilizations. The Western world, on the other hand, was a conquering of Barbarians. The general result of which was to define “civilizing” as making them like the one “civis” Rome. Thus the learning of Latin was a key part of learning to be civilized. In the same way, later supplanters of Roman civilization, the Nation States of Western Europe, defined their own colonizing role as that of making foreign peoples like the people back home. Thus areas of the world “civilized” by the British play polo and cricket, no matter how foreign, or even silly such games should have been in their own culture. The point was to make “Englishmen” (or “Frenchman”, etc.) of the colonies. This difference in attitude, Fr. Michael noted, comes over in the difference between missions in East and West. The East was far more comfortable to take what it found and leave as much intact as possible – using native language and custom as the bearer of the Christian faith – while the West tended to want to make of converts a repetition of the capital (wherever that might have been). I thought long and hard (and am still thinking) about what this might mean to Orthodox missions in America, and in the American South where I serve. I have no firm conclusions, but much to think about. 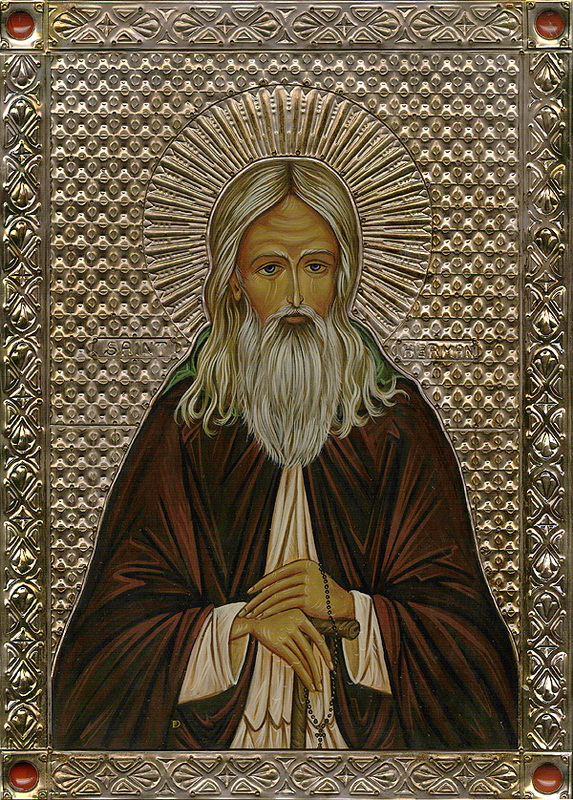 I ask the prayers of St. Herman and others who have gone before and brought Christianity to peoples without thinking that they need to make those people into someone they were not. A fitting meditation. I liked this idea in Fr. Michael’s book about Alaskan missions, but I am left with a nagging question. Protestant missiology has been saying for quite some time now that trying to force European culture down the throats of other peoples was the wrong approach, and arguing for a more contextualized strategy–giving them the gospel but letting them keep their culture. I’m not trying to argue how well this approach has actually materialized–just pointing out that the thinking has been there for quite a while. So when Fr. Michael comes along and frames Orthodox missions in similar terms, I have to wonder, is it just borrowing the Protestant ideal? Now, even if it is, that doesn’t in itself mean that Orthodox missions were not more contextualizing than Western strategies, before anyone bothered to think about it. It does, however, raise some interesting questions about how we live out the implications today. In short, do we as Orthodox end up contemplating the same objective that consumes Protestants, and perhaps by more than coincidence? If we do, how is our answer different? The Orthodox were doing this successfully before Protestantism existed. He is simply pointing out Orthodox missiology in its historical practice. And by placing in the cultural context from which it came notes that this missiology is more or less natural to that “side” of the East West divide. If Protestantism does something right, there’s no need to criticize. One Orthodox priest, a convert, had been a missionary in the Far East. In thinking about the contextualization issue, he became convinced that only Orthodoxy was equipped to do this. He is now an Orthodox priest and works at OCMC. But it would be disastrous for Orthodox to change our missiology now, having been as successful with it for so many years (in a story seldom told). Sounds like a magnificent gathering in Jacksonville. I remember hearing Fr Michael about ten years ago at a lecture in Anchorage. My guess is that the “contextualizing” Protestant methodologies that developed were in some ways healthy reactions to perceived Roman Catholic imperialism in missionary practice. Intentionally or not, the Protestants came to resonate with historically Orthodox practice. Of course, the Catholics should be given their due: we shouldn’t forget faithful evangelists like Francis Xavier and other early Jesuits who developed and implemented sophisticated missiological strategies in various places around the world. I’ve been intrigued (and chastened) recently by some comments made by Fr John Anthony McGuckin, who notes that Orthodox (especially in the so-called Western diaspora) face the temptation to over-emphasize the exotic “otherness” of the Faith, thereby undermining the historic trend towards a faithful translation of the Message. In my experience, one of the most fruitful thinkers in this realm is Lammin Sanneh, whose work is both historically rigorous and faithfully constructive. Of course, there has been great success with the approach taken in Orthodox missions, and we should seek to continue what works. I guess my concern is more of slipping into something analogous with the Westernization that went on in Orthodox theology over the past few centuries. At that time, Orthodox scholars tended to look at Protestant arguments against Catholics and Catholic arguments against Protestants, find points where they agreed with one side or the other, and adopt their reasoning. By doing so, they lost sight of the Orthodox view itself. It seems to me that we could easily slip into the same mentality here when it comes to outreach. We see the old Western strategy of forcing cultural assimilation on everyone else vs. the new Western strategy of contextualization, find ourselves on the side of contextualization, and go along with whatever’s current in Protestant missiology. I’m not saying Fr. Michael is in particular danger of doing that. Indeed, it’s good that he’s highlighting the past examples of Orthodox outreach efforts, to recall Orthodoxy’s own tradition in this area. I’m also not saying that there’s nothing good we can learn from Protestant missions in our current setting. We just need to be aware of the possibility that we’ll end up following their lead too far. I guess maybe some of my apprehension comes from the different setting. If we’re talking about contextualizing Orthodoxy in the American South (or pretty much anywhere in North America), one major difference from the situation in earlier Orthodox outreaches is that the culture is already “Christianized.” I’m not sure exactly how that plays out, but it seems like it would be a bit more complicated than working in a culture that’s never received the gospel in any form. Where do you draw the line between contextualized American Orthodoxy and Protestantized Orthodoxy? How do you communicate that it’s OK to keep some of the religious stuff from local traditions, but that Orthodoxy is not just one more brand of Protestantism? Even something like translation isn’t entirely straightforward. Of course, you want the liturgy in English for English-speaking people. But what about technical religious terms? Do you keep established terms that don’t quite mean the same thing (and try to adapt their meaning), or do you import new terms that sound foreign? I have been blessed to receive an icon depicting our Holy Theotokos seated with Christ on her lap. Surrounding her are those North American Saints: St. Herman of Alaska, St. Tikhon, St. Innocent, St. Peter the Aleuit and two others who I do not recognize (one in Bishop’s robes and the other in what appears to be monastic robes). It is a beautiful icon and one which tells the glory of Orthodoxy in America. There is much to think on in this post Father. I look forward to reading what else crosses your heart during your time in Jacksonville. May God grant you journey’s mercy. You’re asking all the right questions, ones we wrestle with every day, every week. Our congregation’s misisonal context is largely culturally Roman Catholic — South Louisiana Catholic, to be specific. Most of our inquirers were formed in Methodist and Baptist backgrounds. There’s much baggage, some helpful, some not. We work hard at paying attention to the Faith in all of its curious splendor, neither ignoring nor idolizing the strangeness. Keeping Christ at the center is a continuing gift and challenge. We’ve been reading through Archbishop DMITRI’s “The Doctrine of Christ: A Handbook for Laymen” in our adult catechism group. His Eminence does a wonderful job at focusing on the Gospel Message as contained in the Scriptures, while noting that the simple Gospel of Christ has implications for our understanding of the Theotokos, the Saints, the ascetical life, and the entirety of the Great Tradition. I’m sure we err on both sides of the coin you describe, sometimes looking protestantized (especially with our less-than-an-hour-long Sunday Typika services), other times seeming culturally alien and exotic (though it’s really interesting to see our Baptist inquirers coming to love the icons and sing a Panikhida). Along the way, we work and pray to be faithful. May God be merciful to us, sinners that we are! Mark, the modern Protestant missions movement started, for the most part, in the late 1700’s through influences like missionary William Carey (in England) and the Haystack Missions Movement (in America). Hudson Taylor, missionary to China in the mid to late 1800’s, is famous — among other reasons — for adopting Chinese language, dress, and culture in order to reach the Chinese who, up to that point, were largely unresponsive to Western-looking missionaries. My impression is that most modern Evangelical missionary thinking about “contextualization” reflects in part Taylor’s recognition that missions are more effective when missionaries remove cultural barriers to understanding the message and in part the modern Western tendency to denigrate its own culture in favor of others. It appears to me that most Protestant/Evangelical mission organizations are little aware of Roman Catholic missions and thus unlikely to be responding to them, even unconsciously. I hope this may shed a little light on the subject. I have had my share of adult baptisms and the conversion of the unchurched in my parish, as have many, many other priests. Because Orthodox mission is so organic it is sometimes not as visible as one might think. In some settings, where the Church perceives itself as ministering only or primarily to the “Diaspora” mission can easily be neglected. Though there is a huge ministry to be done in some places to revitalize the Orthodox who are already Orthodox. I am intrigued by the questions raised in our contemporary American setting and deeply committed to mission. I have founded or assisted in the founding of 3 Orthodox Churches thus far in my life. And plan, by God’s grace to be involved in more. Fr. Michael, interestingly, focused in his talk on the huge role of the laity in the great missionary work across Siberia and in early Alaska, a role that made possible the later success of St. Herman and others. I’m sure you’re right about the historical origins dating back to Carey, Taylor, et alia. My limited experience with Protestant missions dates back to some seminary classes and training with a mainline Protestant misssions board in the early to mid 1990s. At that time, this particular missions board (and their literature) frequently cited negative examples of what were described as oppressive and destructive Roman Catholic missiological practices (in contrast, of course, to their own more “enlightened” and contextual approach). I thought their reading of the history of missions was rather selective and distorted. Truly, there is much to celebrate, as well as much to lament, in the history of Christian missionary movements (whether Protestant, Catholic, or Orthodox). As one who’s doing “domestic” missions now, I pray that we don’t repeat too many of the mistakes of the past. Pardon me for just posting questions instead of offering some sort of contribution to discussion. How does one contextualize for those who have lost most of their context? The cultures both Eastern and Western churches encountered had dominant religious structures along with languages, customs, and other cultural identifiers. With the West becoming ever more atomized, how will the Church provide context? Is it easier to evangelise those who have a god or multitude of gods or some sort of religious ethos in contrast to those who have little or no religion? I am a new reader, Fr. Stephen, thank you for being a faithful writer. We contextualize, regardless of the situation, by first ascertaining what exists in the minds and culture of those you are evangelizing in the first place. What can be used as a vehicle for the gospel or “completed” by adding the fullness of the truth is used. What must be challenged is challenged. But you do not start by assuming that those you are working with know nothing and are completely hostile to the truth. The true Light which is coming into the world, enlightens every man. As the Gospel tells us, thus we sometimes have to be good listeners to see how the Light has enlightened and to know that God has been at work before we arrived. It’s endemic to ORthodox theology to believe that God is at work in all the world, and that even when man makes error, he frequently still does so as a “logos” bearing human being, and that we can locate the logos within and start from there. We never change the Orthodox faith, but we frequently allow people to see how the Orthodox faith completes that which is lacking, as we say in many of the Church’s prayers. It requires respect and listening on the part of those of us who preach the gospel. Sounds like a bumper sticker, but it is also the Orthodox faith. I had the privilege of hearing Fr. Michael speak last year on Orthodox mission when he was making the circuit of parishes in the DC area. I am sure the picture of Orthodox missions he puts forward reflects an approach that is consistent with the Orthodox faith in general. And it understandably dwells on the most successful Orthodox missions. However, I am willing to bet that there were more imperialistic attempts at mission, and we have forgotten them either because they were unsuccessful or because they were nothing to be proud of. The history of Russia’s treatment of the Georgian Orthodox Church is an example of imperialism at its worst – and that was against a culture that was already Orthodox! Likewise, I think Roman Catholic missions have also taken diverse approaches. The movie, “The Mission,” depicts one example of culturally sensitive Catholic mission – again by the Jesuits. Unfortunately, as shown in the movie, it ran into hostility from other segments of the Catholic world.